Miami, Jan. 13— When you think of Florida wildlife, several animals immediately come to mind: alligators, manatees, and even flamingos, which actually are quite rare in the state’s wild. 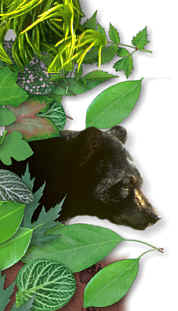 But very few people, other than conservationists, beekeepers, and berry farmers, are aware of the Florida black bear. Two centuries ago, as many as 12,000 black bears roamed Florida’s swamps and pine forests. Today, there may be 3,000. The U.S. Fish and Wildlife Service says today’s bear population is not too bad, all things considered. The federal agency declined recently to include the bear on the nation’s Endangered Species List, saying there were more than enough bears in Florida’s four big national forests to sustain the species. Conservationists counter that while some bear populations may be stable, other smaller groups outside the protected national forests are imperiled by booming real estate development. Michael Bentzien, a Fish and Wildlife official in Florida, acknowledges as much. "The small bear populations are generally in parts of Florida with large development. For some of them, we would likely see them disappearing in the near future," he says. Defenders of Wildlife, a Washington-based conservation group, is threatening to sue the Fish and Wildlife Service in a move to force it to place the animal on the list of protected animals. "The bear is a wide-ranging species. Without prompt action to conserve its habitat its long-term prospects for survival are dim," says Robert Dewey of Defenders of Wildlife. "Development is eating away at bear habitat. We have to act now." Black bears tend to be shy and reclusive. And they like their space. An adult male bear needs 42,000 acres of roaming room, while a female needs about 7,000 acres. By some estimates, forested land in Florida — prime bear habitat — is disappearing at a rate of 200,000 acres a year. And with an estimated 5,000 new human residents arriving every day, the prospects for maintaining large tracts of pristine, bear-friendly forest are dim. Federal officials acknowledge that Florida habitat is itself endangered, but they say the purpose of the Endangered Species Act — which includes the protected species list is to help the most threatened animals. The bottom line, says Mr. Bentzien, is that other animals were in more desperate need of federal intervention than the black bear. "In the end, it just didn’t make the cut," he explains. In the public-relations arena, the bear is a clear winner. Soon, it will soon have its own license plate in Florida. "A bear would be a pretty good politician — I can’t think of any group that doesn’t like bears," says Terry Gilbert, a bear specialist with the Florida Game Commission. "Even the beekeepers like bears [but] they just don’t want them tearing their hives up." David Maehr, a professor at the University of Kentucky, has spent years in the field studying the bear. He says while the Fish and Wildlife Service focuses on bear population numbers, it fails to consider the importance of interaction among dispersed bear communities across the state. He notes that interaction among bear populations helps keep the overall population stable by compensating for any local disruptions like fires, floods, or hurricanes that might otherwise wipe out all bears in a particular region. Conservationists stress their campaign isn’t just a matter of making Florida safe for the black bear. Because of the animal’s status as a so-called "flagship" species, protecting its habitat would also preserve thousands of other animals and plants that live in the same areas. Laurie Macdonald, who runs the Habitat for Bears campaign in Florida, says if the bears were designated as a threatened species, it would make it much more difficult for developers to pave over forested land. She hopes people will see "that what you do for the bear helps all of us." Copyright 1999 The Christian Science Monitor. All rights reserved. This material may not be published, broadcast, rewritten or redistributed.